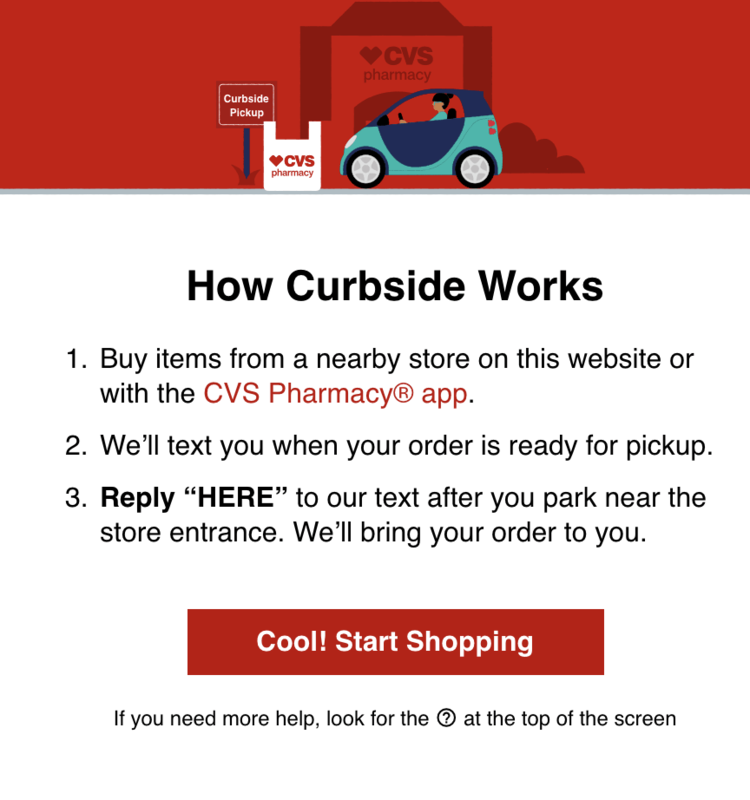 Have you tried CVS Curbside Pickup yet? It is LIFE CHANGING. Think about it – it’s raining and you still need to run out and get shampoo, conditioner, vitamins and your favorite morning cereal. What. Do. You. Do? CVS Curbside Pickup is the solution. You can choose your favorite store online or through their app, select the items that you’d like to purchase, pay for them and then hit send! The rest is easy as pie. CVS Curbside Pickup allows customers to use their CVS Pharmacy App to order health and beauty items, snacks, and any other non-prescription household essentials, and have their order delivered from a participating store right to their car. Not only do customers get to skip the line but they can forget the hassle of in-store shopping all together! I cannot get over this! I have three children and yes, they are all out of diapers at this point. But new moms or moms of young babies, think about how this app is going to change your life. No more lugging the car seat to and from. No more disturbing the sleeping baby and getting them out of their comfortable seat. Now, all you need to do is place your order and then park! Reply to the message you receive from CVS and let them know that you are “HERE.” Then sit back and wait. Someone from the CVS team will come out and bring your order right to your car. Ah-Maz-Ing. CVS Curbside Pickup is now available in 40 major markets across the U.S., including many locations in Boston, New York City, Philadelphia, Houston, Los Angeles, Chicago, Phoenix, Dallas, Seattle and Washington, DC. For specific store locations, customers can use the CVS Curbside Pickup store finder in the app or online to check local availability. The benefits can truly be enjoyed by everyone. What if there is a huge sale on a heavy product that you don’t have the capacity to handle? Now you can pick up anything you’d like and actually not need to lift a finger. The CVS employee will bring it all out to you! Thank you, CVS Curbside Pickup! If you are new to the process, I have great news. Here is a $10 off coupon off of $15 or more. Talk about an amazing discount. Even if you weren’t considering trying out this new feature, this DEAL is so good that it’s worth giving it a chance, right? Basically, you will be paying $5 for $15 worth of goods (plus tax). I’m in!! What are you waiting for? Be sure to head on over to CVS.com and start putting together your order today. **Available on first curbside pickup order. Excludes milk. Expires 12/31/17 at 11:59 pm ET. To receive discounts off your purchase, enter Coupon Code at Checkout. Savings are not transferable. No cash back. Tax charged on pre-coupon price where required. Requires smartphone and location services. In the event of suspected fraud or abuse, CVS Pharmacy® reserves the right to modify or terminate this offer. Curbside pickup is the best thing ever! It saves so much time. I’m glad CVS has started doing this! This is so awesome! It would be really helpful for those with small kids, saving the trip inside. Can’t wait for my CVS to have it. I am so excited that all of these companies are starting curb side service. With our busy schedules, it is such a time saver. Glad CVS is now participating too! I love this so much! I shop at CVS often and having the option of curbside pickup makes life so much easier! I didn’t realize they had this service now! Awesome news. My errand runs will be a little easier! That is a great service! Local CVS’s by me have drive-through usually but this is great for people who don’t have that option! Especially for families, or if you have many errands this is perfect! I would love to take advantage of this one! I think it’s awesome that you can simply go there and everything’s ready for you! That’s awesome service right there! I didn’t know they offered this! This is very handy since I shop here a lot! I love shopping at CVS and had no idea they had curbside pickup! I will definitely have to check this out and see if they have it at our local CVS. This is totally amazing!! I love how convenient it is!Will definitely try this! I love how more brands are introducing curbside service. This is definitely a plus for shopping at CVS.